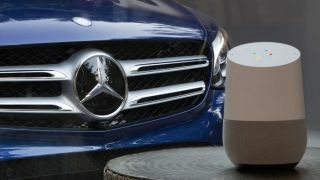 Though Google Home and Amazon Echo are primarily intended for use around the house, Mercedes-Benz is looking to use the smart speaker tech for hitting the road. The auto manufacturer announced today that both Google Assistant and Amazon Alexa, the digital assistants that power the Home and Echo, respectively, are now compatible with all 2016 and 2017 Mercedes-Benz models in the US. To utilize the new integration, users will need a Mercedes me account and active subscription to mbrace, Mercedes' car-connected app. Then, they can do everything from start their vehicle to send directions. Once activated, Mercedes owners can interact with their vehicle via voice commands such as, “OK, Google, tell Mercedes me to start my car,” or “Alexa, ask Mercedes me to send an address to the car." You can see Google Home functionality with Mercedes-Benz vehicles demonstrated in the video below, as well as a tease at what the tech could do on an Android Wear smartwatch. In addition to digital assistants, Mercedes-Benz also plans to add Apple Watch support for its companion app, integration with Nest and Samsung SmartThings home automation systems, and compatibility with Android Wear over the course of 2017. Mercedes-Benz isn't the only one making its cars smarter with digital home goods. This year's CES was chock full of cars merging with new tech, to include Hyundai's recent addition of Google Assistant to its Blue Link-enabled vehicles. Google Home vs Amazon Echo: Which smart speaker is for you?